Groundhog Club co-handler Al Dereume holds Punxsutawney Phil, during the 132nd celebration of Groundhog Day on Gobbler's Knob in Pennsylvania on Friday, Feb. 2, 2018. What was the groundhog’s prediction this year? On Saturday, Feb. 2, 2019, Punxsutawney Phil came out of his stump on the stage at Gobbler’s Knob and said he did not see his shadow, foretelling of an early spring. How accurate are Punxsutawney Phil’s predictions? Organizers say Phil is never wrong. Instead, they say, sometimes the president of the group messes up the translation of what Phil is saying. Meteorologists disagree. Stormfax Almanac says Phil’s prognostications have been correct about 39 percent of the time. Most of the time, based on the records Stormfax has available, Phil has seen his shadow and predicted six more weeks of winter. The last time he didn’t was in 2016. But a PennLive analysis had a different conclusion. Their analysis found Phil and his translators are correct about 64.4 percent of the time. Groundhog Day is always Feb. 2, about halfway through winter. This year, that falls on a Saturday — so organizers are expecting a bigger crowd. 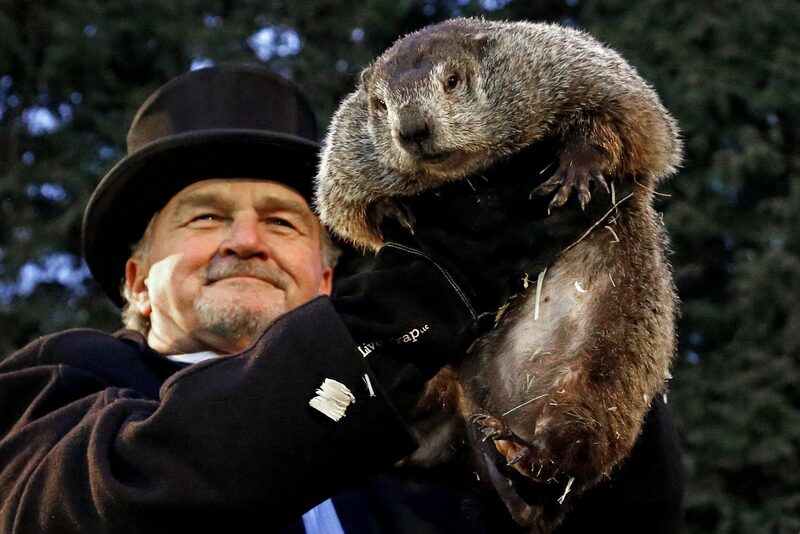 The main event happens at sunrise — around 7:25 a.m. That is when Inner Circle club members, wearing black top hats, lift the groundhog named Phil into the air. They read off a proclamation either: stating that Phil saw his shadow and thus there will be six more weeks of winter, or stating that he didn’t see his shadow and thus there will be an early spring. Here’s one live stream that will be available: https://visitpa.com/groundhog-day-live-stream/. And PCN says it will have live coverage beginning at 6 a.m. on cable and on its app. What if I want to visit in person? The Gobbler’s Knob celebration happens just outside Punxsutawney. The small borough of about 5,800 people is located in Jefferson County, about 80 miles northeast of Pittsburgh. Many other events take place before and after the groundhog prediction, including an art show, chainsaw carving, campfire style sing-along and banquet. The celebration at Gobbler’s Knob begins at 3 a.m. with music and dancing before the groundhog prediction around dawn. Ron Ploucha, an Inner Circle member, recommends people arrive in Punxsutawney no later than 4:30 a.m. so they can take one of the shuttles to Gobbler’s Knob. If you plan on attending, organizers say you should dress warmly and they advise against bringing small children. The groundhog’s prediction at Gobbler’s Knob is free to attend, although tickets for the shuttle buses cost $5 for those older than 12. Finding a place to stay is one of the biggest challenges. But Ploucha says a lot of people do the trip in one day. 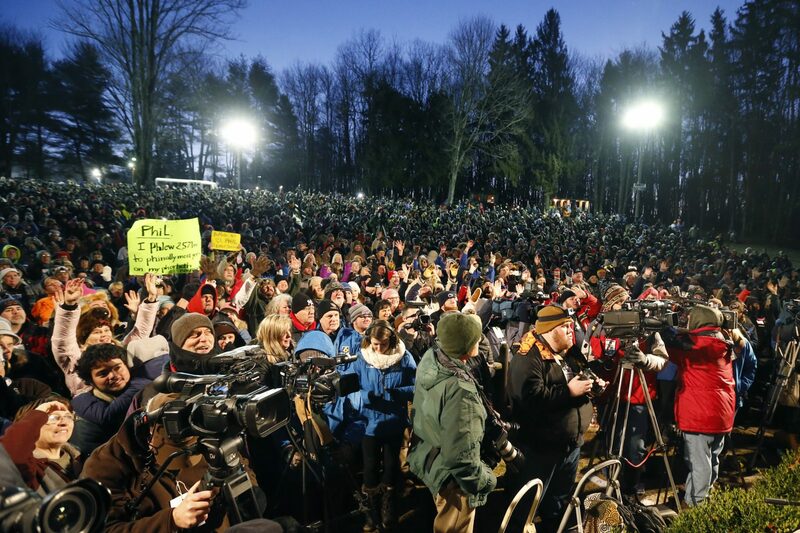 A crowd watches during the annual celebration of Groundhog Day on Gobbler’s Knob in Pennsylvania Tuesday, Feb. 2, 2016. How did the holiday start? The holiday is tied to an old Christian holiday, Candlemas Day, when people would bring candles to a church to have them blessed. The holiday evolved with time, and then Germans introduced an animal — a hedgehog — into the tradition. As German settlers came to the United States, the tradition followed. For want of a hedgehog, they instead used a groundhog. The first official weather forecast involving a Punxsutawney groundhog at Gobbler’s Knob happened on Feb. 2, 1887. Why is the holiday such a big deal? There are two common explanations, and they aren’t mutually exclusive. One is that winter in Pennsylvania feels long and people are looking for something to break up that monotony. There is some science behind this idea. Groundhog Day is not the only holiday that falls in the middle of a season. In the northern hemisphere, autumn has Halloween on Oct. 31. Spring has May Day on May 1, which is a celebration of workers in many parts of the world. And summer has Lammas in the beginning of August to celebrate the harvest. How big of a deal was the Bill Murray movie? Apparently a really big one. In the film, a cranky Pittsburgh weatherman is sent to Punxsutawney to cover the holiday tradition. Bad weather prevents him from leaving, and he gets stuck in a time loop, forced to relive the same day over and over. He’s the only one who remembers the previous iterations of that day. In 2014, the Pittsburgh Post-Gazette published the article “Movie transformed Punxsutawney’s small-town tradition into world attraction.” The article noted that, before the 1993 film, the number of visitors averaged in the hundreds. But the town saw its first 30,000-plus visitors after the film’s release. The day of the week and weather also influence turnout at this annual event. This Saturday, the weather is expected to reach a high of about 32 degrees during the day in Punxsutawney with intervals of clouds and sunshine, according to AccuWeather.com. These days, a smaller crowd is in the 8,000 to 10,000 range, and a large crowd is in the 30,000 to 40,000 range, Ploucha said. Can I see spots from the Bill Murray movie? Sure! Just not in Pennsylvania. So where are those spots? Most of the movie was filmed in Woodstock, Illinois — about 60 miles northwest of Chicago. In 2017, WITF and PA Post digital manager Lisa Wardle traveled to the Illinois town and wrote about the landmarks, including the street where Ned gets punched. In this Feb. 2, 2017, file photo, Groundhog Club handler John Griffiths holds Punxsutawney Phil, during the 131st celebration of Groundhog Day on Gobbler’s Knob in Pennsylvania. Where can I find other “Groundhog Day”/time loop type stories? A lot of science fiction shows and movies have played with the idea. “The Twilight Zone” had an episode about a man stuck in a time loop from the moment of his conviction for murder to his execution. And a season six episode of “Buffy the Vampire Slayer” features a section in which the main character is stuck in a time loop, trying to please a customer at a magic shop while also fighting off a mummy hand. Where can I find other regular groundhog/non-time loop stories? Over the years, several towns have adopted their own Groundhog Day traditions. Sometimes they used a live groundhog to make a prediction. Other times they used a dead and stuffed one. How long do groundhogs live? Groundhogs typically live up to six years in the wild, although they can live longer in captivity. Punxsutawney organizers say the same groundhog has been there for every celebration since the 1880s. They claim that every summer he drinks an “elixir of life” that adds seven years onto his life. We’ll leave it up to you to decide what to believe. 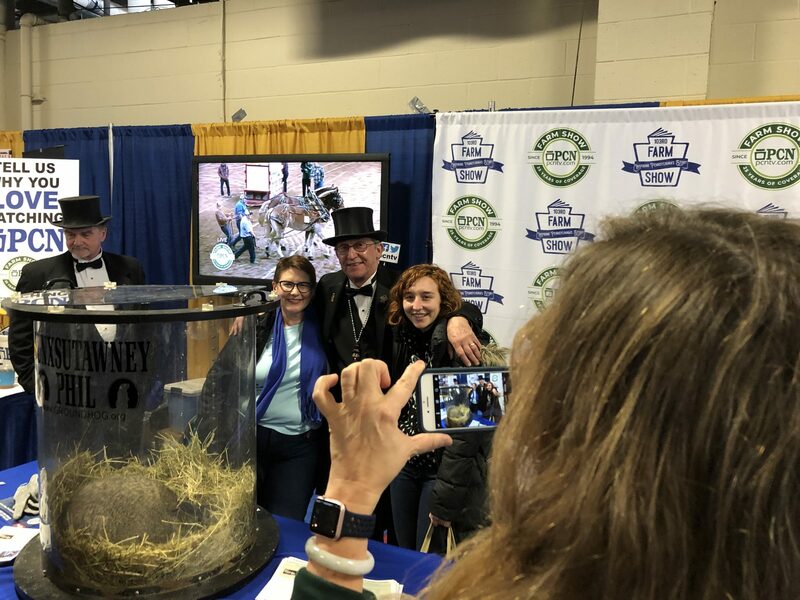 Visitors to the Pennsylvania Farm Show pose for a picture with a member of the Inner Circle and Punxsutawney Phil on Jan. 8, 2019.
Who are those men in the black top hats? Those 15 men are members of the Groundhog Club’s Inner Circle. They are responsible for planning the event and caring for Phil. Ploucha got involved back in the 1990s. At the time, he was a high school teacher and worked on a kids’ quiz show broadcast on a local cable channel. The Inner Circle club member responsible for entertaining at the Knob knew the holiday was growing in popularity, so he turned to Ploucha for help. Why do they wear black top hats and tuxedos? Punxsutawney Phil was named after a king, Ploucha said. And the top hat is a symbol of royalty. “And then, of course, if you’re going to wear a top hat, you’ve got to wear a tuxedo,” Ploucha said. 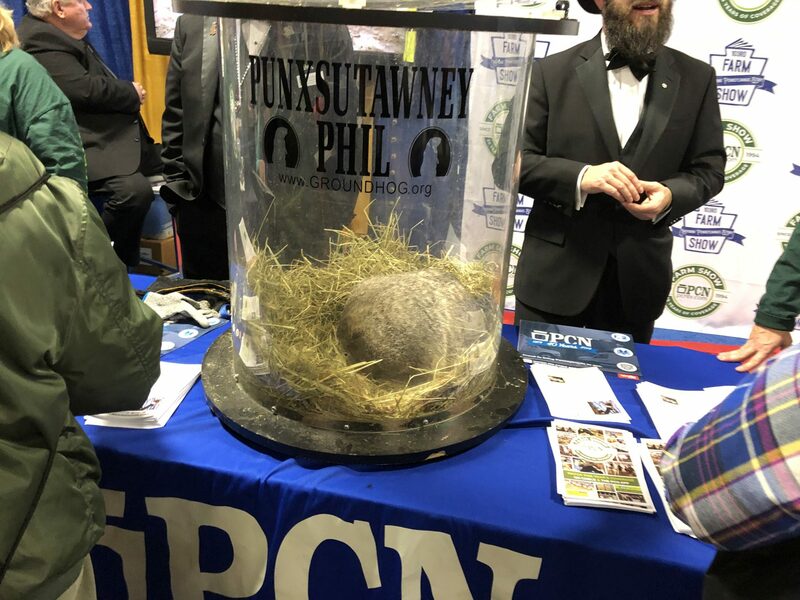 Punxsutawney Phil is seen at the Pennsylvania Farm Show Complex in Harrisburg on Jan. 8, 2019. Where else can I see Phil? The groundhog occasionally travels outside of Punxsutawney. When Ploucha served as Phil’s handler, he took the groundhog to a lot of events, including weddings. Earlier this year, a large crowd formed around the groundhog at the Pennsylvania Farm Show Complex in Harrisburg. Leo Fiester, 62, and Janet Scott, from Sullivan County in northern Pennsylvania, searched for the groundhog inside the complex. “We looked everywhere,” Scott said. “The information people didn’t know he was even here. I said, ‘We’re going to find him,’” Fiester said. Fiester has been to the annual Pennsylvania Farm Show dozens of times, he said. But this year was the first time he saw the Punxsutawney groundhog. 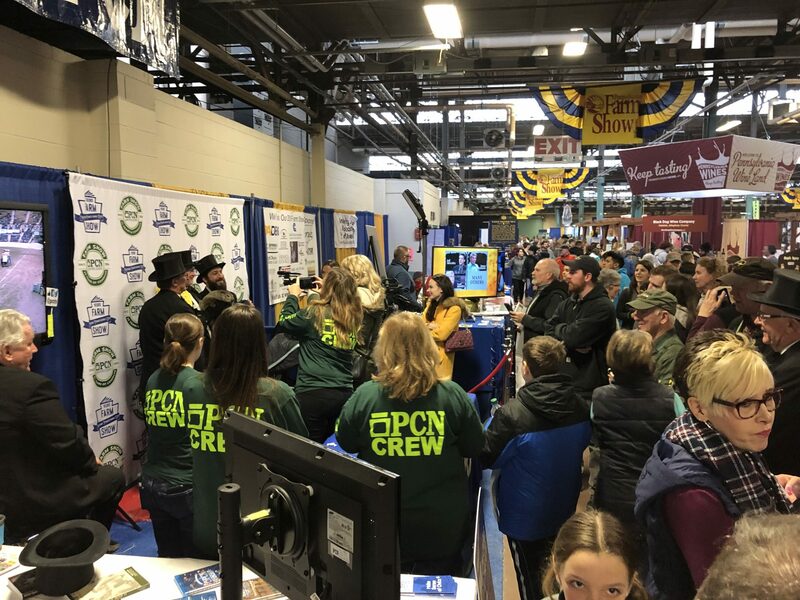 A group of visitors gather around Punxsutawney Phil and members of the Inner Circle on Jan. 8, 2019, at the Pennsylvania Farm Show Complex in Harrisburg. What states care the most about Groundhog Day? Google Trends doesn’t tell you everything. But it does tell you a little bit about people’s interest in Groundhog Day and groundhogs. Not surprisingly, that interest tends to spike each year around Feb. 2. Pennsylvania tends to have the highest interest in Groundhog Day. And the state with the lowest interest in Groundhog Day? Maybe they are less concerned about the end of winter there.